As far as I can establish, the "New West" is "from the desert vistas of the Southwest to the high country panoramas of the Rocky Mountains...", but it's not clear where in the Rocky Mountains. This book offers everything from different kinds of homes, the interiors, external doorways, entrances, kitchens, dining rooms, living rooms, bathrooms, bedrooms, and more. 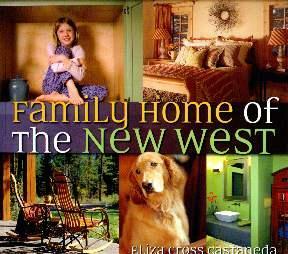 Beautifully decorated, and mostly in a Southwest style, most were pretty liveable and family-oriented. I loved the stone walls on page 3 (what a way to start a book! ), the gorgeous stairs on page 13, and the view on page 100. Of course, as with most books on homes, there are always wonderful ideas to be gleaned and adapated for your own personal decor. Conclusion - Wonderful ideas for anyone thinking of moving to the Southwest, or just wanting to decorate in this style.